Google seems to be testing some new layouts and options in Google Maps. The search giant is anticipated to replace the Driving and Transit tabs that appear at the bottom of the screen, with a Commute tab. Tapping on the new option is said to open up a new page and users get the option to choose from the title bar at the top either 'To work' or to 'To home'. To recall, following an announcement at Google I/O 2018, Google Maps got a redesigned Explore tab. Now, the new Commute tab is reportedly in testing for some users. 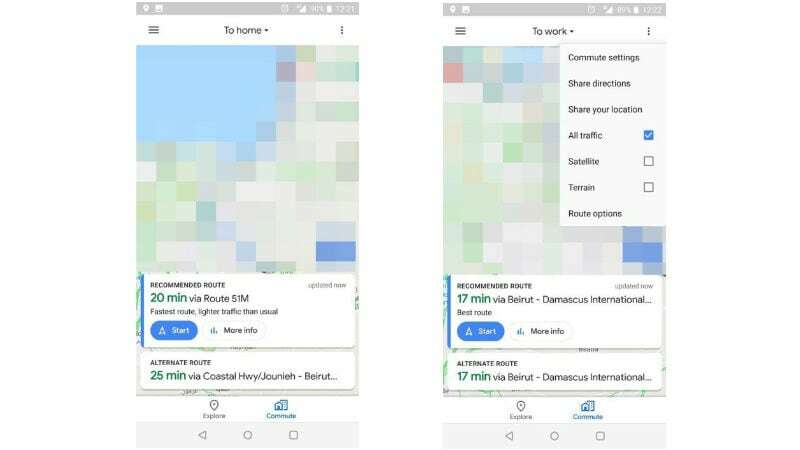 As spotted by folks at Android Police, Google Maps for Android (version 9.85.2) is testing the new Commute tab to essentially combine the Driving and Transit tabs. As mentioned, the new tab puts a title bar on the top of the user interface for navigating to home or to work. It also shows recommended routes based on where the user is travelling to. Based on the option that the user selects, a route card will appear on the bottom of the screen, alongside an 'alternate route'. Meanwhile, tapping on the triple dot overflow menu is said to bring up options such as Commute settings, the ability to share directions, and the options to view traffic, a satellite image, and the terrain. While the upcoming feature appears to make Google Maps more streamlined, it also seems to remove a few handy options. For instance, earlier it was easy to switch between options like driving a car and opt for public transportation. However, these options will get hidden behind the new Commute Settings menu when the new UI is rolled out. It is worth noting that the new UI testing appears to be a limited server-side test and is not available on too many smartphones. The new UI is not a part of a beta update and it is safe to assume that the rollout will start only after extensive testing.